We aim to extend the functionality of Unmanned Aerial Vehicles (UAVs) beyond passive observation to active interaction with objects. Of particular interest is grasping objects with hovering robots. This task is difficult due to the unstable dynamics of flying vehicles and limited positional accuracy demonstrated by existing hovering vehicles. Conventional robot grippers require centimetre-level positioning accuracy to successfully grasp objects. Our approach employs passive mechanical compliance and adaptive underactuation in a gripper to allow for large positional displacements between the aircraft and target object. 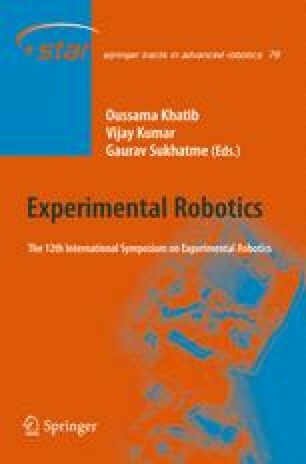 In this paper, we present preliminary analysis and experiments for reliable grasping of unstructured objects with a robot helicopter. Key problems associated with this task are discussed, including hover precision, flight stability in the presence of compliant object contact, and aerodynamic disturbances. We evaluate performance of the initial proof-of-concept prototype and show that this approach to object capture and retrieval is viable.